This figure is taken from a famous fiction by Swedish Nobel prize winner in literature, Selma Lagerlöf. The story called ”The Wonderful Adventures of Nils” was first published in 1907, and is about the boy named Nils Holgersson and his journeys around historical provinces in Sweden while traveling on a goose. Learn and practice origami for free with the figure templates below. 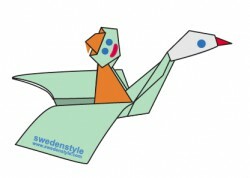 Click on the text ”Nils on flying goose”. Print out the template on your printer directly from the browser. Please read our terms and conditions before downloading the templates. Good luck! If you have problems opening files in your particular browser, try right clicking your mouse (ctrl+click with Mac) and ’save link as’ on to your computer. Then open the files with a PDF reader, we recommend using Adobe Reader. If you don’t understand the folding symbols, please download the PDF file below!